On October 8th, Dr. Troy Hicks led a workshop on approaches for digital texts. As we adopt smartphones and tablets for 1:1 instruction, we need to review our efforts at comprehension instruction for all kinds of digital texts. Based on a survey of over 800 adolescents, Troy and participants discussed principles of "Connected Reading" and how we can adapt existing comprehension strategies in digital spaces, and explored new opportunities for finding, managing, and reflecting on digital texts. See our whole day documented on the companion Wikispace. 4T Virtual Conference Needs Presenters! We are seeking motivated, imaginative, and forward-thinking educators to present at our 4T (Teachers Teaching Teachers about Technology) Virtual Conference in May 2016. These K-12 teachers and administrators use technology to enhance communication and learning in their classrooms and schools. Read more and apply HERE! Our Inquiry into Disciplinary Literacy and Learning (IDLL) group met for the first time on September 24. 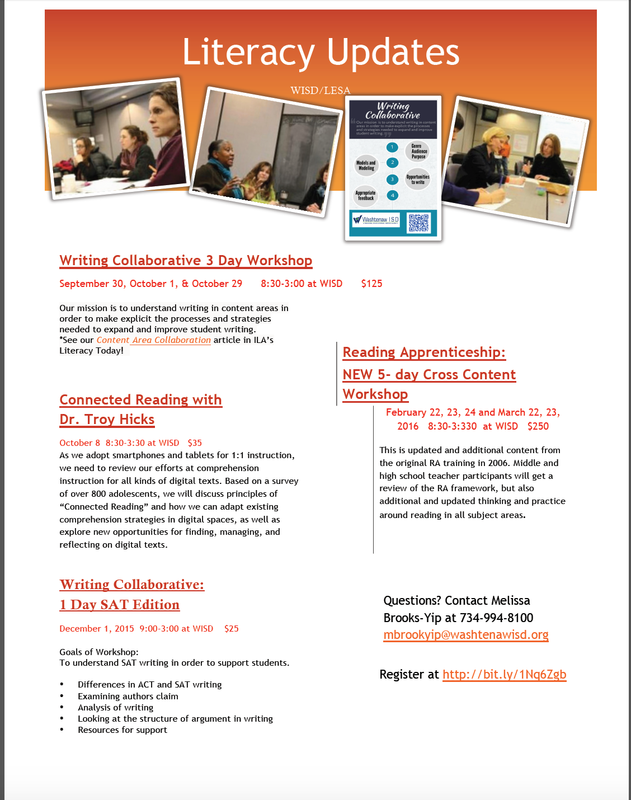 With our foundation of Reading Apprenticeship and Writing Collaborative, we are coming together to take a deeper dive into the latest work around disciplinary literacy in grades 4-12. We read Collaborating for Success: The Vital Role of Content Teachers in Developing Disciplinary Literacy with Students in Grades 6-12. Read with us if you'd like to get a taste for what IDLL is all about! The Study of Early Literacy (SOEL) network welcomed new members on September 30, launching our third year of learning and practice around early literacy instruction in grades PreK-3. Some of our studies will include Dr. Tanya Wright's (MSU) All About Words and Dr. Nell Duke's (UM) Information in Action. Research has proven that students in all grades should be reading informational text throughout their day, but sometimes it is difficult to find appropriate informational texts outside the textbooks. ReadWorks.org has a collection of K-12 science articles, searchable passages by topic and lexile and grade level articles. SAVE THE DATE for the 4T Virtual Conference! This happens to fall on our first day of school this year! The International Literacy Association has named this year "People Power: Start a Literacy Movement." ILA provides an activity kit for all ages inspired by their focus country, the Philippines. You can also build a Little Free Library as a service project to celebrate literacy all year round. If you celebrate International Literacy Day, ILA asks that you share on social media with #ILD15 on Facebook, Twitter and Instagram. This year's book is Do Unto Otters: A Book about Manners by Laurie Keller. Are you new to Michigan Reads? Check out the video , overview, and programming guide available from the Library of Michigan. 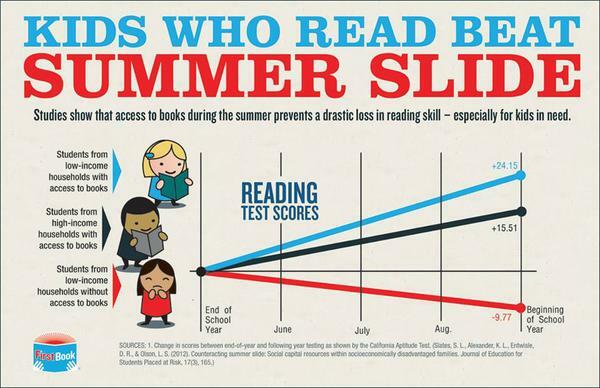 We share summer reading lists with students to keep them reading over the summer, but what about educators? There are lists for you, too! 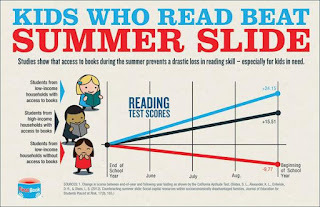 Education Closet's Summer 2015 Reading List has suggestions for professional learning, pleasure reading, family reads, and a look ahead to titles for your classroom next year. What are you reading this summer? Share your titles in the comment section. Echoes and Reflections is a comprehensive Holocaust education program that delivers professional development and a rich array of resources for middle and high school teachers. Echoes and Reflections prepares educators to teach about the Holocaust in a way that stimulates engagement and critical thinking while providing opportunities for students to see the relevance of this complex history to their own lives. 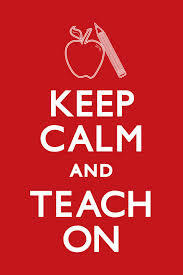 How do you Keep Calm and Teach On at this time of year? Get outside! This is a good time for students to write using the five senses, nature observations, the health benefits of being outdoors or a myriad of other things that come to us with a change of scenery. Reflect! Teachers and students need to reflect upon all the hard work done throughout the year. Take some time to review all of that and write reflection letters to yourselves or parents. Storytelling! If you feel you didn't read aloud as much as you wanted to this year, or your students like oral storytelling, make time for that now. It's engaging for all age groups. Wonderopolis to explore the many questions kids have. 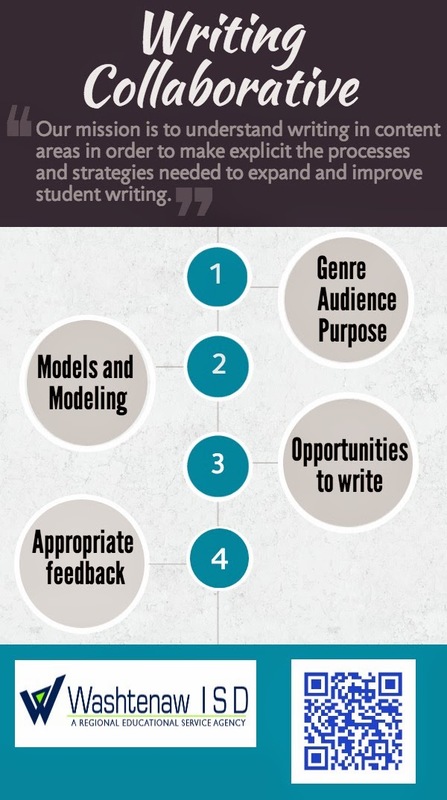 Helping teachers and students understand writing in the content areas in order to make explicit the processes and strategies needed to improve student writing. Lunch not provided. SCHECHS available. The Study of Early Literacy (SOEL) is a committed group of PreK-3 educators learning, researching, and applying best practices in the teaching of early literacy. While SOEL gears up for our third year, we are pleased that our work has led to a publication in the Michigan Reading Journal. Interested in joining us this summer and for the 2015-2016 school year? Read and complete this form or contact me at mbrooksyip@washtenawisd.org or 734-994-8100 ext. 1266. August 27, 2015 8:30-3:30 at WISD. Open to ALL Social Studies teachers in grades 6-12 FREE SCHECHS availableLunch not provided. April 23 was a day of Crafting Digital Writing with Dr. Troy Hicks for over 75 teachers of Washtenaw and Livingston County. Our day is documented on Troy's Wikispace designed especially for that day. Through careful consideration of our Mode, Media, Audience, Purpose and Situation, we explored multiple digital tools to use for our own writing as well as in K-12 classrooms. After a look at many real-life student and teacher examples, we had time to explore and create. A group favorite was WeVideo, a tool for creating digital stories. *Save the date for October 8th, 2015 when Troy returns to work with us on Digital Reading! May 16, 17, 18- virtual and free! This virtual conference is hosted by the faculty at the University of Michigan School of Education and School of Information. The WISD and LESA is proud to partner in 4T. The conference is FREE and OPEN to all educators. The sessions target K-12 practicing and preservice teachers. Links to the virtual rooms are found on the conference schedule page. SCHECHS are available. Register today! The Study of Early Literacy (SOEL) is a committed group of PreK-3 educators learning, researching, and applying best practices in the teaching of early literacy. While SOEL gears up for our third year, we are pleased that our work has led to a publication in the Michigan Reading Journal. Interested in joining us this summer and for the 2015-2016 school year? Read and complete this form or contact me at mbrooksyip@washtenawisd.org or 734-994-8100 ext. 1266. A message coming through loud and clear in all of our teacher network studies here at WISD/LESA is the importance of authentic literacy experiences for students. From collaborations with Dr. Nell Duke to Dr. Ernest Morrell, our learning this year moves us toward making school activities authentic for students. Listen to what Nancie Atwell, winner of the first Global Teacher Prize, says about authentic literacy experiences. The Study of Early Literacy is a committed group of PreK-3 educators learning, researching, and applying best practices in the teaching of early literacy. While SOEL gears up for our third year, we are pleased that our work has led to a publication in the Michigan Reading Journal. If you ever wanted to know more about SOEL and the network model of teacher professional development, this article is for you. Still have questions? Contact me!